Location: In Pontypool town centre in Hanbury Road opposite the junction with Glentorvaen Road. A Public Library built by the Andrew Carnegie Trust in 1908. It was designed by Messrs Spiers and Bevan of Cardiff and cost £1,889. 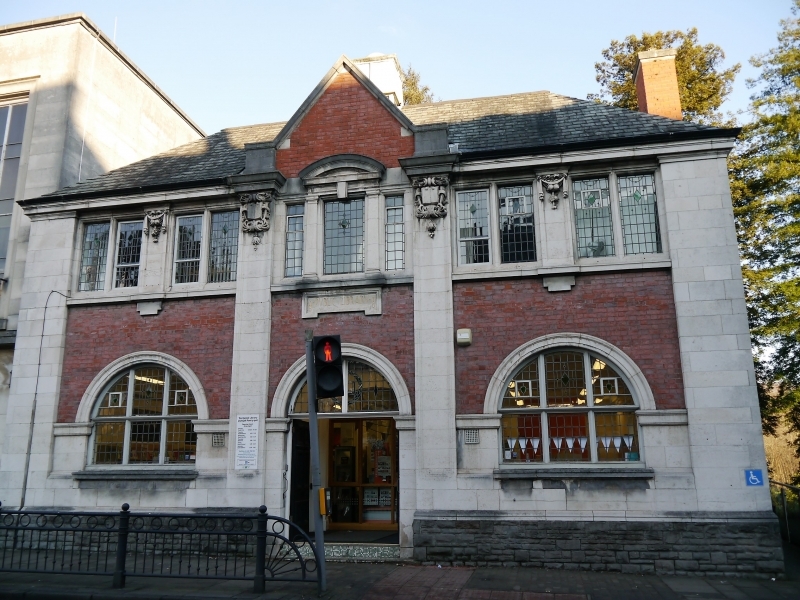 A public library in the Edwardian Baroque style built of red brick, glazed on the front elevation with a plinth of coursed rock faced pennant limestone rubble and dressings in Portland limestone ashlar; Welsh slate roofs. The building has a two storey front block with a projecting single storey wing behind. The street elevation is in three bays with arched windows on the ground floor flanking a recessed central entrance. The facade is framed by giant pilasters wider on the corners, and with console caps in the centre. The Portland plinth reaches up to impost level on the ground floor windows and the windows and door have arched architraves, Three light mullion and transom windows. The upper floor, in the outer bays, has paired two light windows with stone mullion, and a wider mullion between with console cap. The central window is tripartite, again with a stone frame, the central light has an apron and a segmental pediment. The apron carries the inscription Public Library 1908. Eaves frieze, hipped roof with central brick gable above the entrance. Red brick stack to right and altered domed ventilator in centre of roof ridge. Side elevation has additional stone quoin pilaster. Rear elevation is extremely plain. The interior has a large room on the ground floor with a central hall leading to a stair with a wrought iron railing. The hall is divided from the flanking rooms by a three arch colonnade with segmental arches and panelled square columns. Two upper rooms house the office and the Reference Library. A plain, but remarkably unaltered interior. There is also a lower floor due to the falling ground and this contains one large room with the ceiling supported by two cast iron columns. A good and extremely unaltered example of a Andew Carnegie Trust Library for a medium sized town, and having group value with the listed buildings opposite. In Pontypool town centre at the junction of Commercial Street and Glentorvaen Road.